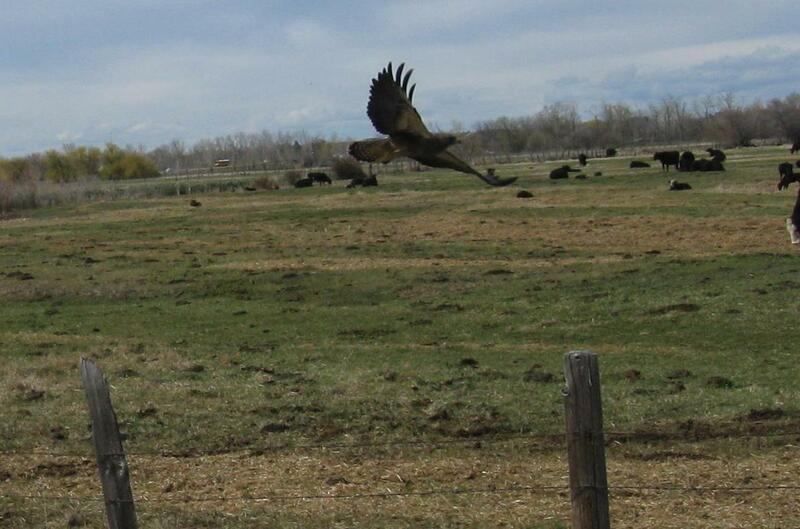 The Swainson's Hawks have returned to my part of Idaho with a vengeance. One our birding trip to Washington County, Idaho, we saw several and I have seen several others recently in the greater Boise area. I still remember seeing my first one on a country road in Nampa, Idaho. It was a textbook bird and made for an easy identification with my Sibley Guide. Below is a photo of a Swainson's Hawk perched nonchalantly on a fence post in Star, Idaho that I took from my open truck window. After a few moments if did finally fly off. They are one of my favorite hawks. Perhaps it is because they spend North America's winter in Argentina where I lived and served for two years. Perhaps it is also because a pair nested here in my neighborhood of Avimor, but the nest failed and I pity them. I hope they come back to Avimor this year! UPDATE: I just found them this afternoon building a nest at Foothills Heritage Park! 1. In flight, look for the lighter leading edge (shoulder) on the wing, with darker flight feathers. (see photo below) This feature seems to hold true for all the other color variations among the same species. 2. While perched, you should see a darker tail - helps to eliminate all the Red-tailed Hawk morphs. 3. 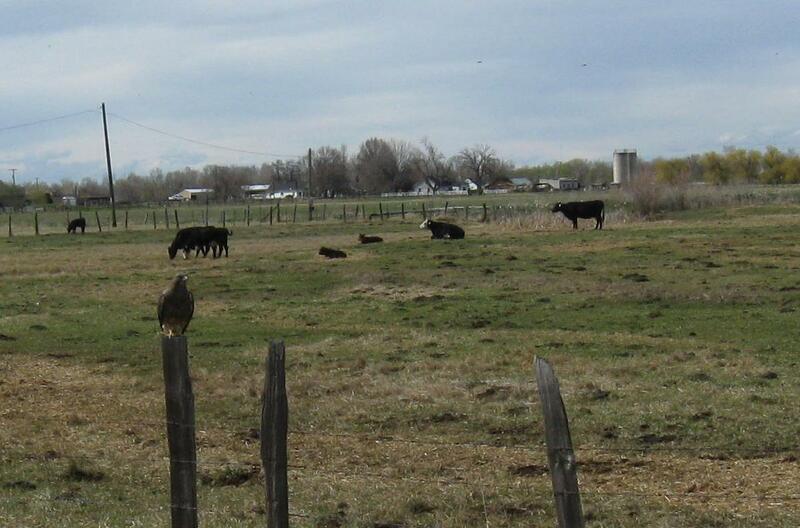 Swainson's are often seen perching on the ground or on low fence posts. During seasons where they overlap with Rough-legged Hawks, this might not be as helpful, but during the summer it seems to be a trait that makes Swaison's different. Red-tails may be on the ground when feeding, and Northern Harriers will sometimes perch low, but when I see a big dark hawk on the ground, it is most often a Swainson's. 4. Swainson's do seem to have some variable plumages. Compare how dark the breast and belly of the Star Swainson's versus the light-bellied and hooded pair that nested at Avimor last year. 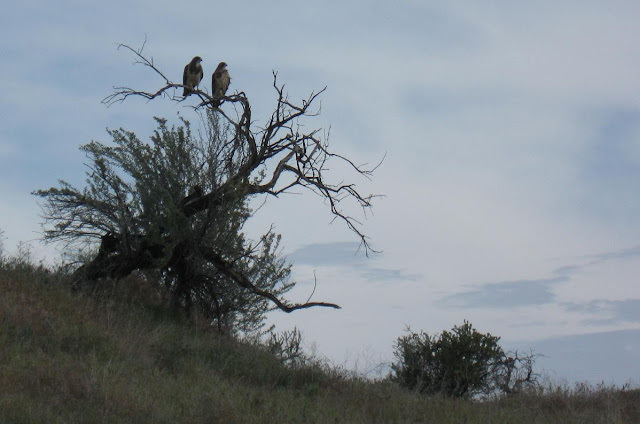 Good tips on IDing the Swainson's Hawk Robert. Raptors can be tough to ID sometimes, especially when you have immatures and multiple species in the area that have similar traits. You are very lucky to have Swainson's breeding locally, they are a Threatened Species in California. @Larry - thanks for commenting Larry. I recall last year in New York they had a Swainson's Hawk and those folks were really excited. That gave me some perspective and increased my joy in having Swainson's Hawks as my regular friends.